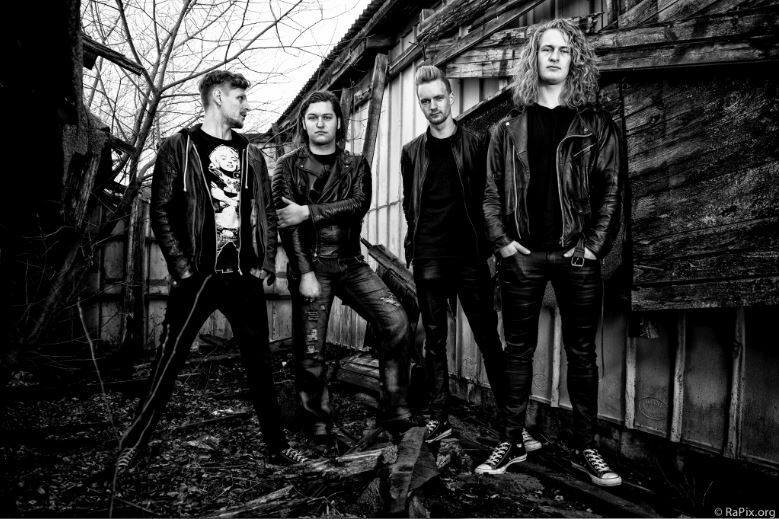 "Hard Rock's New 'Mad Dog'"
Denmark's Black Oak County are a heavy four-piece that slide perfectly into that niche between hard rock and heavy metal. The band formed in Esbjerg in 2012 and released their self-titled debut album in January courtesy of Mighty Music (Tygers of Pan Tang, Sea). The album was recorded at Jacob Hansen's (Volbeat, Hatesphere) studio and produced by Jonas Haagensen (Aphyxion). Already BOC have received rave reviews including UK outlets like Flick of the Finger (5/5) and Powerplay (8/10). On the heels of the album release is the band's lead-off single, "Mad Dog", a punchy hard rock number with some swing. Maximum Metal scribe Eric Compton was able to chat with charismatic guitarist/vocalist Niels Beier about the band's start, recording process and why so many three-word bands begin with "Black". Eric Compton: Congratulations on releasing your first record! 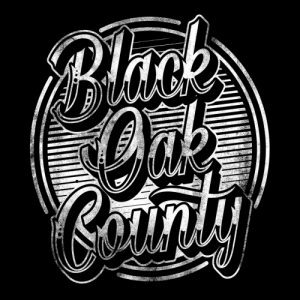 The self-titled debut from Black Oak County is the perfect greeting to the new year. The album released on January 13th through Mighty Music. First, right off the bat, tell me what you are feeling right now, knowing the long wait is over and the first album is in hands all over the world. Niels Beier: It's crazy! We never thought we'd get to experience this! We're so thankful for having had the opportunity to work with our label, who helped us come this far – without them our album probably wouldn't have been purchasable anywhere other than at our shows. EC: This is a new band and a debut album, so let's start at the beginning. BOC is based out of Esbjerg, Denmark. Were the four of you friends or colleagues growing up in the same town? Had you known each other prior to 2012? NB: Jack and Mike are brothers, so naturally they've known each other forever! I'd met René when I was 19 or something. I didn't get to know him ‘till years later when I was approached by Jack at a local show and asked if I could be a stand-in bassist for his band, Anything Goes, in which René was the singer. Jack and René were in that band together, but prior to that René had been playing in another band with Mike and Jack's dad – so the three of them definitely have known each other for a long time now. EC: So, the band formed in 2012. At that time, did it just grow and evolve from local shows and cover tunes? NB: The band started out being called Great White Buffalo, which we changed prior to releasing our album due to trademark related issues. As mentioned, I was a stand-in bass player in Jack's other band for a few shows, and once that ended Jack and I just kept coming back to the rehearsal space we'd practiced in. I brought a guitar this time, and we started jamming upon having realized a lot of our influences were the same when it came to guitar. After having sketched out a few songs, we brought in Jack's older brother, Mike, who'd been playing for 6 months or so and we eventually found a bass player. We created enough material that allowed us to do shows, but yeah, there was a cover here and there. We used to jam "Mississippi Queen" by Mountain and "Blame It On The Boom Boom" by Black Stone Cherry at our shows, which was a lot of fun! However, as time passed our bass player left and after a long time of searching René picked up a bass, learned our songs and became a member of the band. In the wake of our first bass player leaving we started focusing more on our songwriting, because we had nothing better to do. Without a bass, we couldn't perform live, so we really just zoned in on the material we'd written so far, tossed some of it, improved a lot of it and wrote a bunch of new songs. EC: The band has experienced early success already. You guys managed to tour with Danish icons D-A-D. How hard was it to play out live without an actual record for fans to relate to? NB: We opened for D-A-D in our hometown of Esbjerg, which was a milestone – we've been fans of that band ever since we started listening to rock music and they're just sort of icons in Denmark. Everyone knows who they are, everyone knows at least one of their songs by heart. We had a bunch of other merchandise, but we definitely felt like we were missing a record. A lot of people asked us about it after the show and it sucked to only be able to tell them, "Sorry, check our one song out on YouTube!". However, we're quite convinced that not having any physical copies of our songs for the first couple of years just made people more curious to who we were and what we sounded like! EC: Of the ten tracks that are featured on the record, what's some of the oldest songs that the band have been playing live? Does the album versions sound similar to the earlier live versions of those tracks? NB: "The Bogeyman" was actually the very first song we ever wrote! So, that dates way back to day one of the band! It's kinda crazy really, because our songwriting has come a long way since we started out, yet that song just works. Nothing was changed, we just added the menacing guitar bends in the breakdown at the end which gave it an Alice In Chains-sorta vibe. Other than that, we've got a lot of songs that we throw on the set-list every now and then, but they didn't make it to the album – we're not throwing them away though! We've never thrown a single riff or song away in the band. Every time someone comes up with something, we record it and store it in our "vault" for future inspiration, or whenever we're gonna start working on the second album! EC: Late last year BOC recorded the album. Did the label deal with Mighty Music come before the record was recorded or after the finished product? How did that deal come about with Mighty? NB: It started out with us going into the studio and recording in the late summer of 2015. Initially, we were going to make a six-track EP that we were gonna publish ourselves, but at the end of the recording process I sent the songs to my good friend Soren Andersen (guitarist, producer, engineer: Glenn Hughes, Mike Tramp), knowing he'd recently started his own label. Before we got to talk about it, Soren forwarded the material to Mighty Music and we got in touch – ending up with the record deal. A few years back Jack had gotten in touch with Mighty as well and had sent them our very first demo recordings. Nothing really came of it back then, and I can't blame them: those recordings were really bland. After writing back and forth with them for a few months, we signed a deal at a show in our hometown and that was the last show we played as Great White Buffalo and the first as Black Oak County! Part of the deal was we had to record at least two more songs before Mighty would release anything, so we got a deal with our studio and recorded four songs instead, making it a ten-track album rather than a six-track EP! EC: ‘BOC' was recorded at Jacob Hansen's Hansen Studios. That studio is one of the top-notch studios in all of Europe (and probably one of the more expensive) and has hosted a lot of stellar hard music releases. It's fitting that ‘BOC' can be added to that list. This probably goes without asking but why did you pick that location? NB: We had a lot of studios in mind, but really we wanted to find the studio where we got the most bang out of our buck. At first we wanted to record at Medley Studios in Copenhagen, which is co-owned by our friend Soren Andersen and so many killer records have been made there. But initially we trashed that idea due to the logistics of it: we couldn't afford booking a straight week, and going back and forth between Esbjerg and Copenhagen would cost us a fortune. So, we got in touch with Jonas Haagensen, who was an acquaintance of ours, and had him come to a show and then we made a great deal on the studio. Besides, Hansen Studios is only a 30-minute drive from our rehearsal space, so it couldn't be easier with the logistics of things. Because we tracked with Jonas, we didn't pay the full price as we would have with Jacob as our engineer. But we love the way the album sounds! Can't thank Jonas enough! EC: Instead of Jacob handling production duties the job went to producer/engineer Jonas Haagensen. Now he is mostly known as an engineer and has very few production credits. What was it like working with him and how did he enhance what BOC was trying to accomplish with this album? NB: Jonas is an incredibly talented producer as well! He mostly works as an engineer in the studio, but he's working all the same projects as Jacob Hansen and he's amazing at what he does. Recently he just wrote, produced and engineered his own band, Aphyxion, and their latest album ‘Aftermath'. I haven't been able to put that album down since it came out, it sounds so good! The songwriting is killer, the production is just spot-on and everything about his work on that is just awesome! He was great because he only interfered in our compositions if something didn't feel right, and luckily we didn't have much of that. Every single vocal harmony on the album, and a lot of the "filler" guitar tracks on the songs is Jonas' doing as well and he was great at telling us what to play, when to play it, and why he thinks we should play exactly that. Before we started recording, we sent a bunch of material to Jonas telling him, "I like the guitar sound on this", "Listen to these drums! ", "That sort of vibe is what we're going for", etc. In the end, we found a way to put all of our references into this big cooking pot and out came something that sounds like "us". But, you can definitely pick out the different flavors in there! EC: In terms of the BOC sound, I sort of scratched my head. We could pick it apart and try to categorize it into hard rock or heavy metal or any number of sub-genres that exist. I just call it a hard music album. It has parts of hard or melodic rock with songs like "If You Only Knew". That sort of southern bottom heavy swing exists with "Never Cared" and "Rated R for Redneck". Then other cuts like "Someone Else" are just balls-to-the-wall heavy groove metal. Describe BOC in your own words and tell me what bands and records have influenced the group. NB: At first, we got together and wanted to have a certain sound, with a very select few bands as our main sources of inspiration. After a while though, we sorta just dropped the idea. The thing is, when you put a label on things, especially music, you limit yourself. Had we called ourselves a hard rock band we probably would have had people complaining about "This isn't hard rock, that's southern rock, that's classic rock…that's metal". Simply, we've chosen not to identify ourselves too much with any given genre or sub-genre because it would create unnecessary limitations. We're just four guys who love music and some of the ideas we're throwing around definitely doesn't sound like anything we've ever done before. We don't want to have to throw those ideas away or save it for another project. When it comes to bands, when we started out (Jack and I), we both loved the works of Zakk Wylde. Everything he's done with Ozzy to his solo records, Pride & Glory and of course Black Label Society. Zakk's music was sorta like the foundation on which this band was built and it definitely showed in the early years. Black Stone Cherry is another hugely influential band for us; I remember picking up a copy of "Between the Devil & The Deep Blue Sea" and just rushing down to the rehearsal space going: "Guys! You need to check this out!". Other than that, there's the classics: Black Sabbath, Lynyrd Skynyrd, Led Zeppelin, AC/DC, Motörhead and a million other bands. What's so cool about us, I think, is we have a very different taste in music, all of us. Jack loves classic rock, René listens to everything from Aerosmith to Lamb of God, Mike is sort of a metalhead and I can honestly say I love gospel, country and 70's pop tunes as much as I do hard rock, death metal and everything else! It brings an incredible big pallet of inspiration into our lives and it's what keeps us going as a band, because there's always something new that inspires us. EC: You chose "Mad Dog" as the opening single for the record and have an official video to accompany the track. Why did you choose that song as the ambassador for new fans? NB: "Mad Dog" is the sort of song that just sums up what we're all about. It's straight forward, to the point, heavy and has a pretty great chorus. It's one of those songs we've noticed stuck in the audience's heads when we had performed it live, so we figured it had potential as a first single. EC: Just looking at a handful of early reviews – 5/5 Flick of the Finger, 9/10 Rockstruck, 8/10 Powerplay. Classic Rock Magazine also featured BOC as a track of the week. Based on the early responses it sounds like 2017 is off to a really good start so far, right? What's next for the band? Summer circuit, touring, upcoming singles? NB: We're working hard to book a tour to support the album and we've just got some festivals here and there as well. Currently, we're playing a local festival alongside Mike Tramp, Amaranthe and Ugly Kid Joe, which I think will be a lot of fun! Basically, we just want to play live as much as possible, so we're booking as many shows as we possibly can. I can't promise to much, but we might do a video for our newest single, "If You Only Knew", and maybe a third single for another tune from the album – we'll have to wait and see! "I'd like to think our songs represent the shadowy side to everything we grew up around and with. A lot of the songs on the album have an "ominous" or darker meaning to them and I try to show in my songwriting that not everything is what it seems." EC: I was talking with another Maximum Metal writer last night about the sudden infatuation with three word bands that start with "Black". Black Star Riders. Black Swamp Water. Black Country Communion. Black Label Society. Black Stone Cherry. Black Water Rising. Black River Rebellion. Blackberry Smoke. I could go on. Come on man, what's the deal here? Black Oak County could get lost in the band name list. Why did you name it that and is there any fear that the band's name could be confused with others? NB: There's a lot of "Black" bands out there, I give you that. When we had to change our name from Great White Buffalo we had this big brainstorming session and just put words, names and all we could think of up on this huge whiteboard and then we just started eliminating possibilities one by one. We came up with Black Oak County and the first thing we did was a Google search to check if anything or anyone else had taken the name. Turns out no one had, and that was probably the thing that made us go "Yup, we'll take it!". It does have a meaning to us though. As mentioned, we're from the town of Esbjerg. Our county sigil is a big, white oak tree on a blue shield and I'd like to think our songs represent the shadowy side to everything we grew up around and with. A lot of the songs on the album have an "ominous" or darker meaning to them and I try to show in my songwriting that not everything is what it seems. EC: What were your top 3 albums from 2016? NB: There has been a lot for us – it's almost impossible to nail it down to just three for us, because we listen to so many different bands. But I guess we could go with these: ‘Kentucky' by Black Stone Cherry. One of our all-time favorite bands and heroes. They just keep making great sounding records! ‘Resonate' by Glenn Hughes. And speaking of great records! Our friend Soren Andersen produced, engineered and played guitar on this album, which was recorded at his studio. Glenn needs no introduction, he's rock and roll royalty! Killer album! "Ellipsis" by Biffy Clyro. I have listened to this album weekly ever since it came out! I absolutely love Simon Neil's songwriting and I've been a massive fan of Biffy ever since ‘Opposites' came out in 2013. The songs on here are just amazing, no matter if you like straight up, dirty alternative rock, or beautifully acoustic tunes, this album has it all. EC: Okay, parting words for new fans. Where can they get band updates, hear your music and generally tell you their thoughts on the album and shows? NB: We're very active on Facebook! Go to facebook.com/BlackOakCounty and write us a message or post on our wall and we'll get back to you guys in no time! As for our music, you can stream it on Spotify, or buy it on iTunes! EC: Again, congratulations on the album. It's a beast of a record and one that I will continue to enjoy the rest of this year and in the years to come. Maximum Metal wishes you nothing but success! Take care. NB: Thanks Eric! We appreciate being asked to do this interview! Take care! Niels Beier Eric Compton 2/3/2017 "Hard Rock's New 'Mad Dog'"